Starting Sunday, December 11, the United Nations Alliance of Civilizations will convene over three days its fourth Annual Forum in Doha, Qatar, at a pivotal time in the region. At the UNAOC Forum, over 2,500 political and corporate leaders, civil society activists, youth groups, faith communities, research centers, foundations, journalists, ministers, and heads of state will come together in Doha to agree on joint actions to improve relations across cultures, combat prejudice and build lasting peace. Hosted by the ruling Emir of the State of Qatar, Hamad bin Khalifa Al Thani, the Forum will count among its attendees the High Level Group member from Qatar H. H. Sheikha Mozah, UN Secretary-General Ban Ki-moon, and High Representative for the UN Alliance of Civilizations President Jorge Sampaio. Political dignitaries at the forum will include several Heads of State, including the President of Austria Heinz Fischer and the President of Germany Christian Wulff. A number of ministers of foreign affairs – including those of co-sponsors Spain and Turkey – and of Australia, Indonesia, Luxembourg, among others have also announced their participation at the Forum. Several personalities such as Secretary General of the Arab League Nabil Elaraby, Secretary-General/Director-General of the OIC, IOM, UNESCO, UNWTO and the Union for the Mediterranean, as well as high representatives from the African Union, the European Parliament, HRH Prince Hassan Bin Talal and HRH Princess Rym Ali of Jordan, and eminent scholars such as J. Esposito or Jeffrey Sachs, will also attend the Forum. 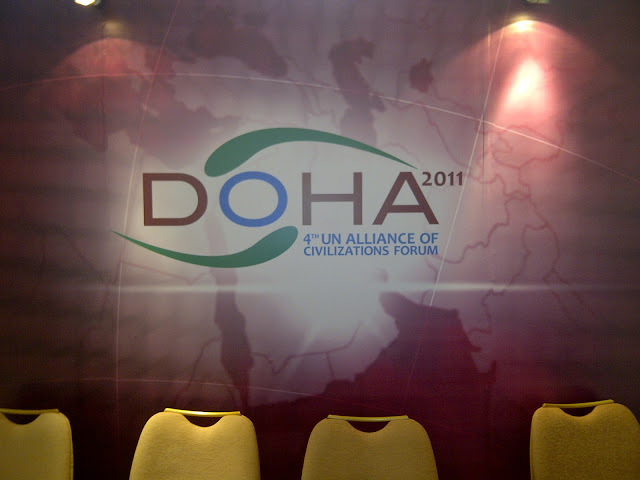 The UNAOC’s Forum in Doha will be a milestone in the UNAOC’s existence. In Qatar, the UNAOC, the host government, and numerous partners will make headway for global intercultural dialogue to emerge as a key driver for development, security and peace. Under the theme ‘Intercultural Dialogue to Boost Development’, high-level debates on how advancing towards the goals of the UNAOC can contribute to foster sustainable development and, in particular, achievement of the MDGs, will be conducted. The Doha Forum will be a platform to share ideas and learn from each other, present new initiatives and announce exciting commitments from partners and the organizers. The program will also feature project-specific working sessions, interactive discussions and debates, as well as provide a convening space for civil society organizations to present their exciting initiatives. Over 400 youth and 300 civil society organizations representatives will participate in the Forum, half of whom are from the Arab region. Participants will tackle issues such as: the challenge of promoting integration in multicultural societies, how cultural diversity can bolster development and create jobs, the role of women in sustainable development, the role of religious leaders in promoting peace and development, and the impact of media on perceptions of other cultures. Ten years past 9/11, the Doha Forum will also focus on West-Islam relations, the main raison d’être of the Alliance, and will address how to counter rising discrimination, prejudices and hate speech that fuel tensions and extremism. Through roundtables, workshops and debates, participants will put their minds together to agree on joint actions and make pledges. The Forum will also host a Head of States Summit taking place on December 11. This year, the UNAOC is also in partnership with a number of media organizations such as Al Jazeera, Google, France 24, Euronews, National Geographic, but also corporations such as BMW for the intercultural innovation award, or research centers such as the Brookings Institute. The United Nations Alliance of Civilization (UNAOC) was established in 2005, at the initiative of the Governments of Spain and Turkey, under the auspices of the United Nations. A High-level Group of experts was formed by former Secretary-General Kofi Annan to explore the roots of polarization between societies and cultures today, and to recommend a practical programme of action to address this issue. The Report of the High-level Group provided analysis and put forward practical recommendations that form the basis for the implementation plan of the United Nations Alliance of Civilizations. On 26 April 2007, former President of Portugal, Jorge Sampaio, was appointed as the High Representative for the UNAOC by Secretary-General Ban Ki-moon to lead the implementation phase of the Alliance. The UNAOC Secretariat, which is based in New York, works with a global network of partners with States, international and regional organizations, civil society groups, foundations, and the private sector to improve cross-cultural relations between diverse nations and communities. It also works at the grassroots level, promoting innovative projects that build trust, reconciliation and mutual respect. The Alliance works in four program areas to support such projects. These areas are: youth, media, education, and migration.